The Washington Aluminum Company, Inc. has been awarded over $1.5 million in contracts by Avondale Industries, Inc. for aluminum fabrications on fleet oilers under construction by the Louisiana builder. The two separate contracts cover the fabrication of eight shipsets of portable stanchions and dunnage systems and seven shipsets of accommodation ladders. "Washington Aluminum Company was involved in the original design of aluminum accommodation ladders for the Navy in the late 1940s," said Robert Pickens, president of Washington Aluminum. "We are truly pleased Avondale Industries has selected us for what we see as an important role in this TAO project." 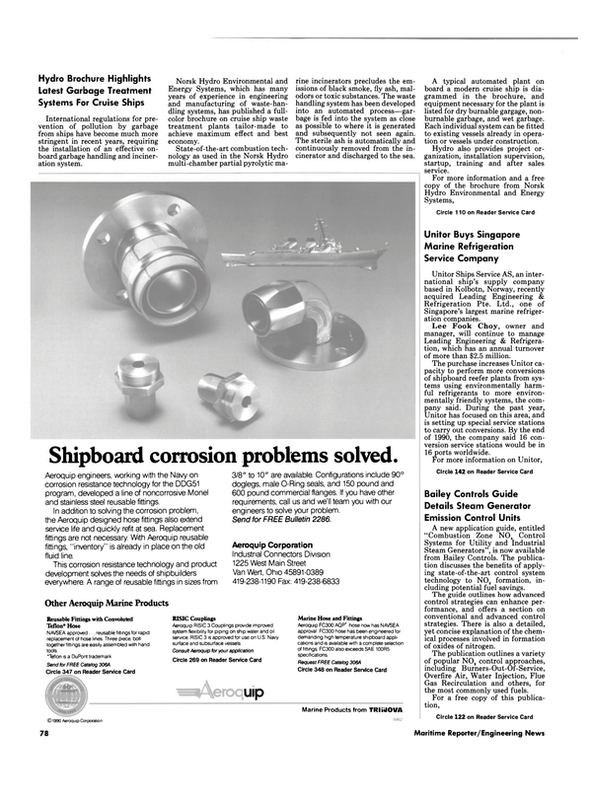 The Washington Aluminum Company has provided over 40 years of continuous service in the design and manufacture of products for the Navy. The current project, according to marine customer service manager Stephanie Koltko, includes dunnage identified as "an overhead and deck track system with movable stanchions for munitions cargo containment.